PMI India award recognizes and honours excellence in the project management profession and education. 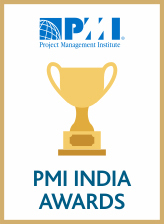 PMI, one of the world's leading not-for-profit membership associations for the project management profession, has been administering PMI India professional and academic awards in India to honor excellence in the project management profession and education. The PMI awards program instituted for professionals and academicians are well recognized by Industry, Government, Academia, and project practitioners as the most respected and valued platform in the country. It is a fitting acknowledgement to the winners for their valuable contribution to the project management education and profession. Instituted in 2009, PMI India Awards for professionals recognizes and honors a project team that has delivered superior results through exemplary application of project management principles. The recipients of the PMI awards exhibit achievements and talents of their respective company and project teams that exemplify project management excellence. The award recognizes the efforts of project managers for successfully completing the project in the agreed time frame, complexity and marked budget and also for realizing the benefits that were intended at the start of the project. The awards are given away at the annually held Project Management National Conference in India. 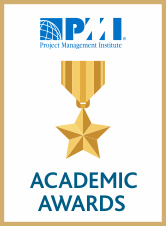 PMI India Academic Awards have been instituted in 2011 for recognizing Academicians who through their outstanding contributions in education, research, training, consultancy and advocacy have made extraordinary impact in establishing the role and significance of project management education in India. The awards are given away during the PMI India Research & Academic Conference held on a biennial basis.